Cornwall, with its hundreds of miles of accessible coastline, is a popular summer jaunt. Yet in the spring and especially around Easter, the sea begins to warm, the lifeguards take up their positions and the surf schools begin putting their boards and wetsuits out. But to get the best out of a visit at this time of year it pays to go rustic and enjoy Cornwall as the Cornish know it. That means donning a Parka and boots and relishing the fact that you are in countryside as diverse and unspoilt as it is possible to find. 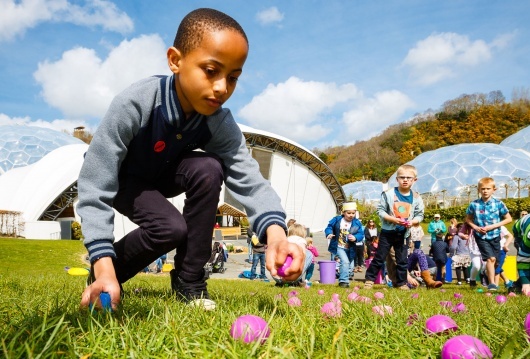 The Eden Project are hosting their annual egg hunt which they promise will be bigger and better than ever this year, with themed games and a chance to learn more about the actual creatures that lay them. Eden rarely disappoints. Entry is included in the admission price so adds to what is a fairly complete day out. Doc Martin fans have until the end of March to join tours of the fictional fishing village of Portwenn. One of the extras, who lives in the real village where it is set, gives 90-minute walking tours and is full of anecdotes as he leads visitors around key locations such as the doctor’s house, Louisa’s school and Mrs Tishell’s pharmacy. It’s every bit as hilly as the fictional village, and because the series uses the local scenery to such full effect, you’ll recognise every inch of it. One tip: the schoolhouse building in the series actually hosts the nearest cafe to the car park and makes some of the best sandwiches for miles. One of the most exclusive art galleries in a county known for its galleries celebrates its 10th anniversary with a special collaboration of works by the cream of the region’s artistic talent, many with international reputations. Owner Sarah Adams whose coastal landscapes are exhibited regularly in Mayfair has invited friends to join her in her Padstow Studio and, over two floors, works by Anita Taylor, Mo Farquharson and Chris Thomas will feature among contemporary paintings, drawings, ceramics and sculptures in bronze. Thomas’s iconic oils of his Cornish home earned him a shortlisting for the 2016 Columbia Threadneedle Prize. A team of experts will be guiding a tour through an exhibition of Viking Voyagers at a museum commended as a leading family destination at the 2014 British Travel Awards. It includes 1000-year-old ancient artefacts and antiquities, many on loan from other museums, including the National Museum of Denmark. And there’s the chance to climb aboard a replica Viking ship. Entrance is free with the museum ticket. The museum itself is worth a visit for its key attraction – a lookout tower which features telescopes, binoculars and all sorts of computer interaction to get the most out of it. Cornwall is, naturally, big on guided walks. One of the best is the one organised by the Cornwall Wildlife Trust which takes you to the nature reserve of Looe Island. It takes three and a half hours and begins with an early afternoon boat trip from Looe, a pleasant way to start if you have a flat-calm. Wardens meet you when you disembark and do their best to spot grey seals. Dogs aren’t permitted and it’s not wheelchair friendly as the boat does tend to rock about when you reach the jetty and you have to climb over the side to get off. The St Dennis Steam and Vintage Rally is only in its second year but has already made the move to the heart of Mid-Cornwall’s clay country, sensible given that its 35-acre plot provides bags of room to expand in future. This is a true family experience as it brings together loads of vehicles, from military lorries to motorbikes, in a place big enough for children to scamper around when they’re not on the bouncy castles or enjoying the swing boats. Rustic and outdoorsy.